Hello! Back for a little Christmas joy. 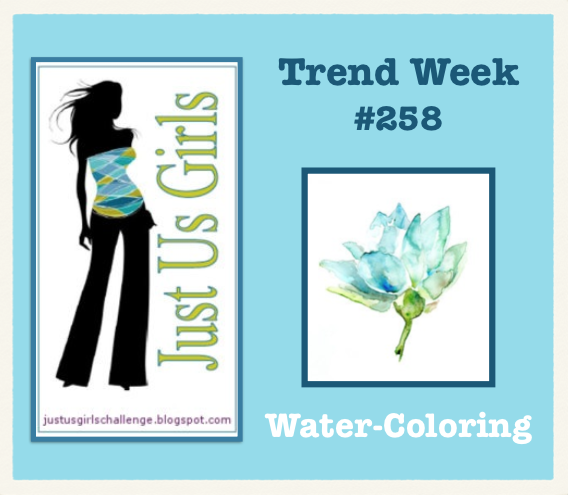 I made this colorful card using a Digital image from Graphics Fairy and some scraps of paper from Authentique paper pad Collections Wonder. I attached all to a Card base of Red CS from my stash. Rushing to meet a deadline. 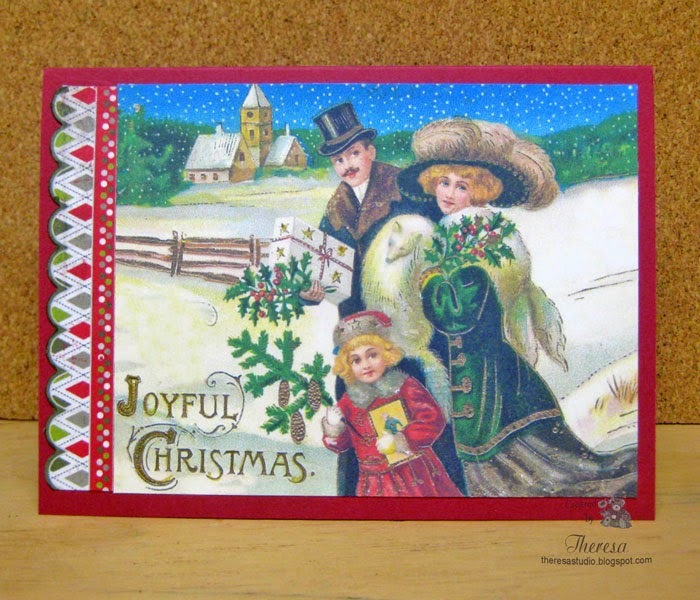 Craftyhazelnut's Christmas Challenge: #196 Make it colorful. Welcome! Can you believe today is the end of September? 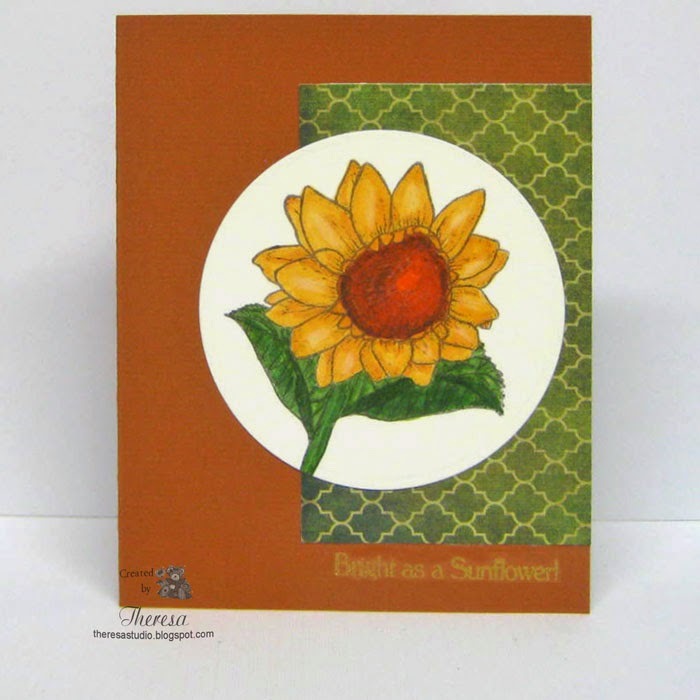 I love creating cards for fall and using sunflower images. This image is a MFP stamp from Bring Us the Sun set stamped with Memento Espresso Truffle ink and colored with Copics YR 12,14,18,21 and YG 63 1nd 67. I added some texture to the center with a Glaze Pen. I cut the flower with a Nestabilities Circle Die andplaced on a panel of pattern paper from Teresa Collins World Traveler pad and a card base of Pumpkin color Textured CS. The sentiment from the same stamp set was stamped with Versamark ink and embossed with Ranger Embossing Pearl Gold EP. 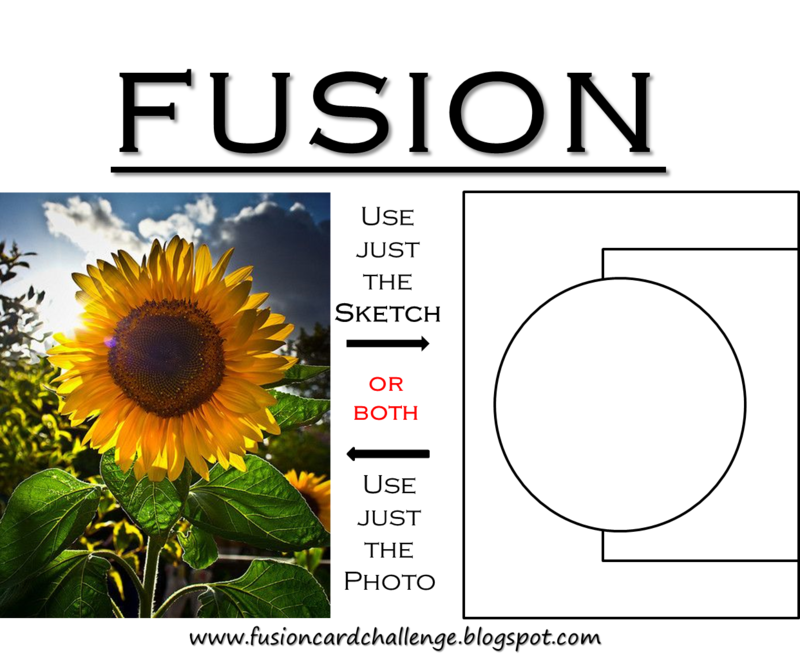 Fusion Card Challenge: I used both the sketch and photo shown in the graphic on the right. Love the great sketch. Hello! 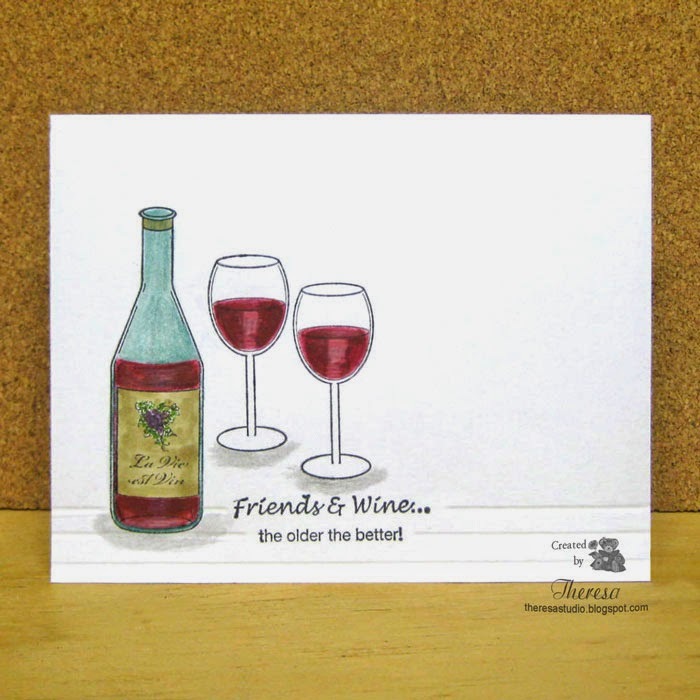 This card was inspired by a post by Christine Okken on the Power Poppy Blog to color with Copic Re-inkers shown here. I did not actually color the image with re-inkers but did heat emboss the image and sentiment on vellum and colored on the back with Copics. I used a re-inker to fill in the space around the image with blue. I backed the vellum with White CS before framing with the Orange Card base. I added some Green ribbon to finish. I am entering this to the Power Peep of the Week challenge. 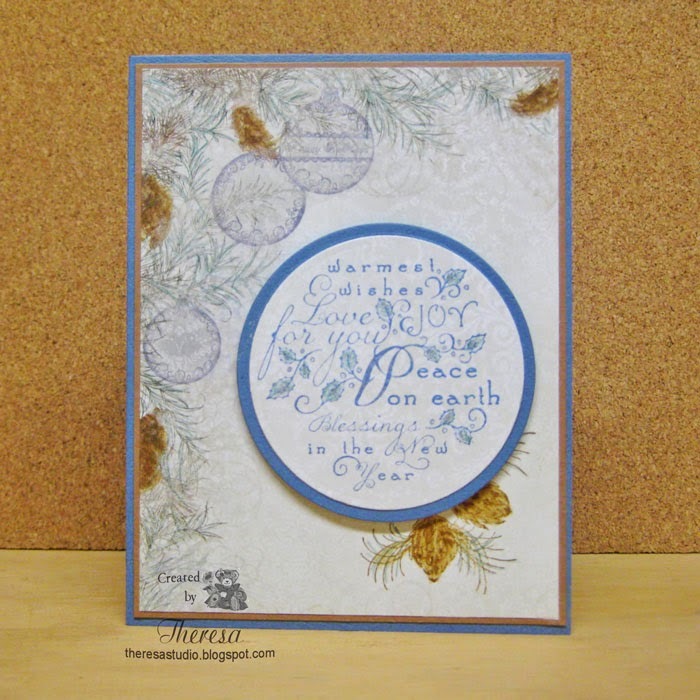 Thanks to Christine for sharing her tutorial on using re-inkers. Hello! The month of September has flown by and Thanksgiving will soon be here. 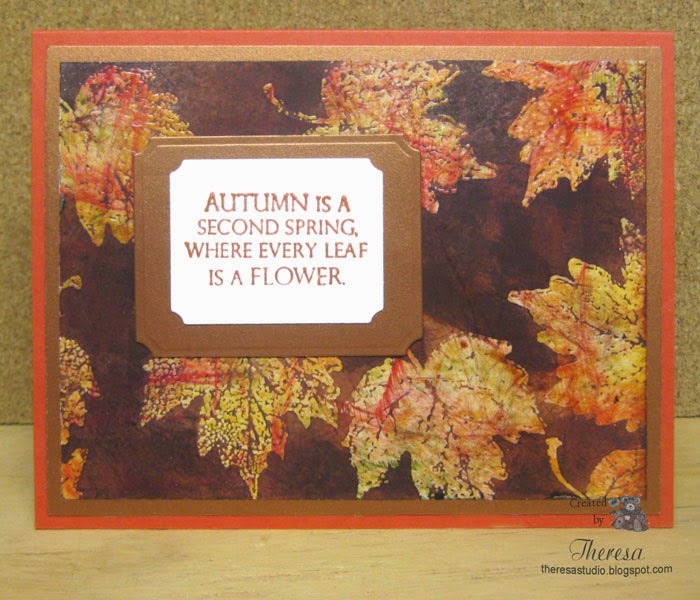 I made this quick card focusing on some pattern paper printed from GKD Digital paper pack All About Autumn. I have many digital papers but forget to use. I placed the pattern on a card base of Dark Brown CS and then added a strip with a border of Fall Acorns and Leaves that was embossed with Ranger Embossing Pearl Gold. The stamp is from GKD A Year of Borders by Melanie. 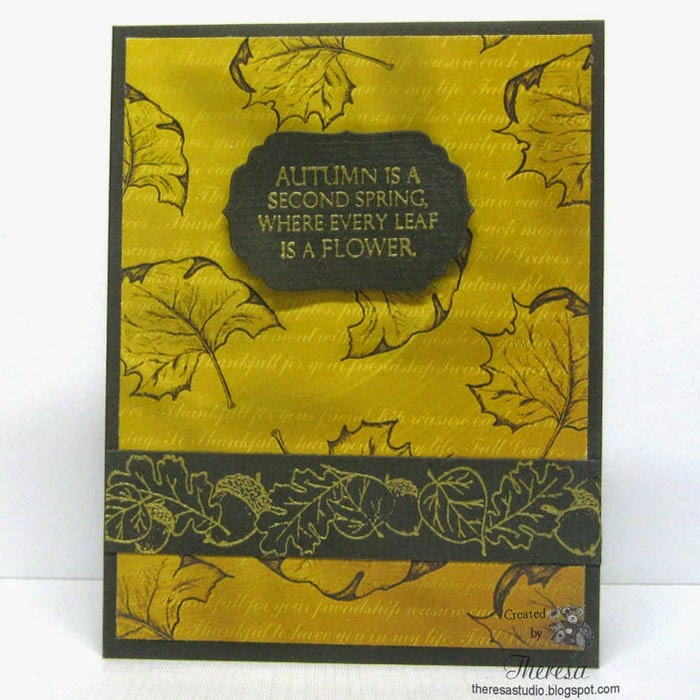 The sentiment from GKD Always Autumn by Theresa was embossed in the same way on a Rectangle die cut with Nestabilities. I did another version of this card for Stamp TV Challenge Mix It Up Monday Falling Leaves using a verse from GKD A Year of Leaves by Melanie shown on left. Hello! What lovely weather we are having! 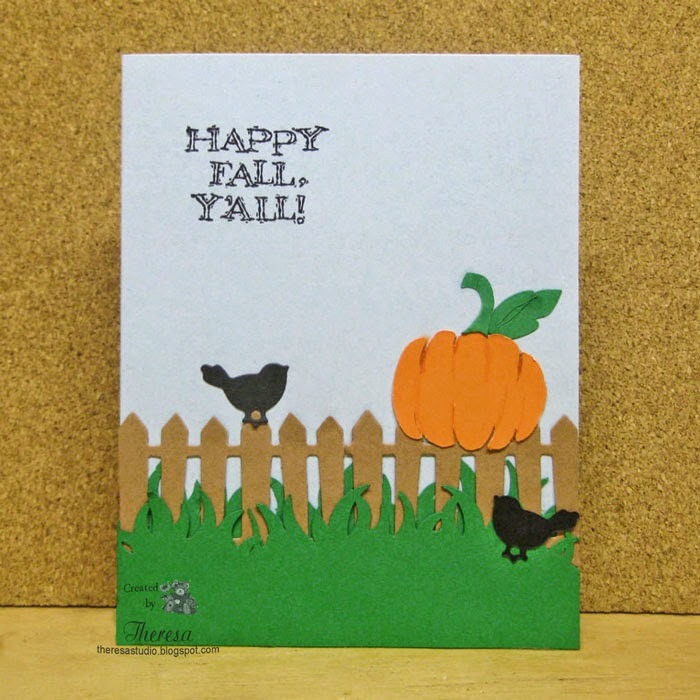 And the leaves are turning to beautiful fall colors which has inspired this card. I made this card using GKD stamps from A Year of Leaves by Melanie. The leaf was stamped several times with versamark on Ivory CS and heat embossed. I also stamped a couple on another CS that I fussy cut after water coloring all the leaves with Distress Inks Barn Door, Peeled Paint, Spiced Marmalade and Wild Honey. My first plan was to color with Copics but then decided to water color even though I was not using watercolor paper. Using a card Base of Dusty Sage, I layered a mat of Honey Mustard and attached the trimmed image of falling leaves and then the 2 cut leaves with pop up dots. I stamped the GKD sentiment with Memento Peanut Brittle ink and sponged the top layer with DI Antique Linen before assembling the card. All papers used are from GKD. Posting this card reminded me of the song Autumn Leaves. Welcome to my studio! Today I am doing something that I seldom do or maybe have never done. 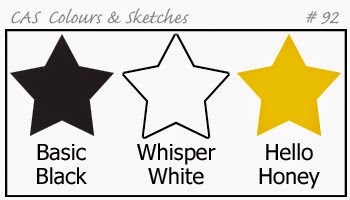 I am doing 2 cards for a sketch challenge .... I did not read any rules that say only one entry. Since I had the sketch and the papers and stamps on my desk, I was inspired to create this design in another color combo. 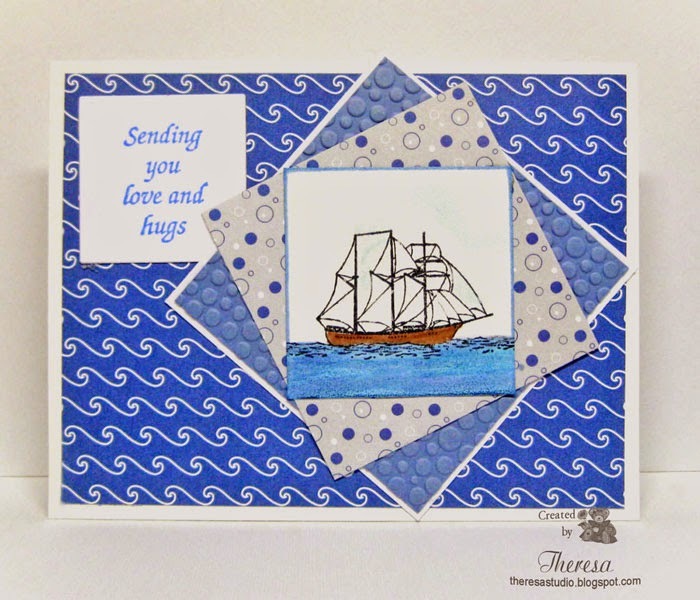 I stamped the Repeat Impressions Ship (which is a Tri Masted Schooner according to my DH) on White CS with Memento Tuxedo Black and colored with Memento Summer Sky and copics. The pattern papers used are from GKD Poolside pad and card base is Glossy White CS from stash. The RI sentiment was stamped with SU Ballet Blue. The Cuttlebug EF was used on the solid blue layer. There is something fun about this sketch that I just had to use again. Hello! 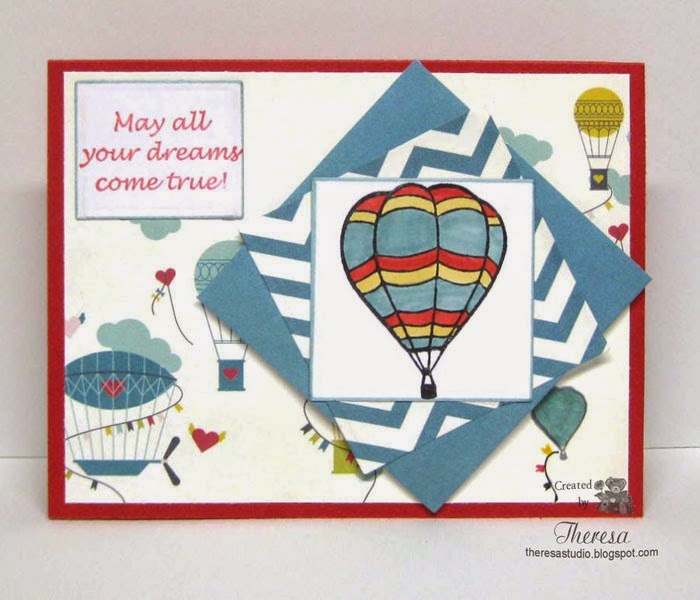 I'm flying high again with the Hot Air Balloon stamps from Repeat Impressions using their Sketch Challenge shown on the right. I love when I have Pattern Papers that combine so well with my stamps. I started with a Red Card Base and added a Pattern Paper from Fancy Pants Wonderful Day pad. I cut squares of 2 other patterns from this pad and topped them with a white square stamped with the RI Large Hot Air Balloon which I colored with Copics BG72, Y32, R 27. In the lower right corner, I stamped the smaller RI Hot Air Balloon to fill in the empty space and added the hanging rope with pennants to copy the design of the paper. To finish, the sentiment from Repeat Impressions was stamped in Memento Red ink on White CS and inked around the edge with BG72, the same as the image. Hello? How was your weekend. I hope it was better than the Bear on my card who is not feeling well. 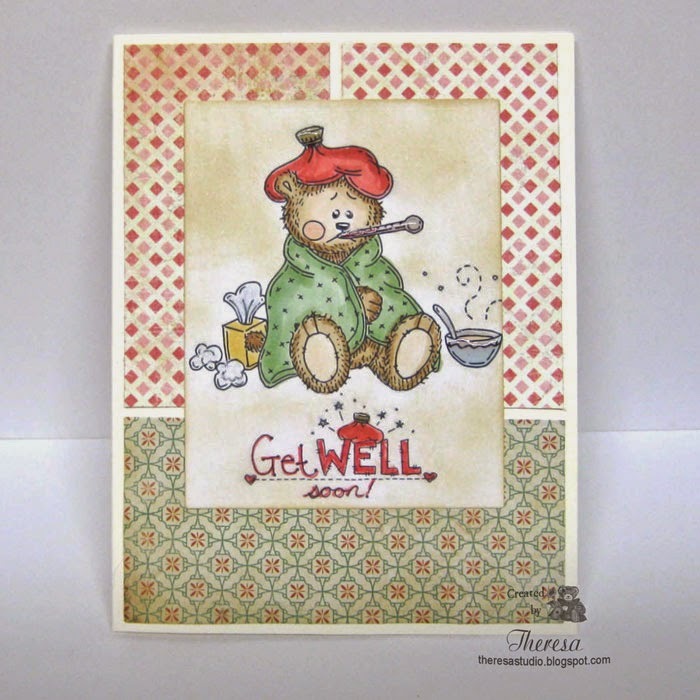 He's a Meljens Digital image called Sick Little Bear printed with one of her sentiments. I colored him with Copics and added some Glossy Accents and glitter with Wink of Stella. I sponged DI Antique Linen around the image to darken the White CS. I used Ivory CS as the base and Panels of Patterns from Crate Paper DIY Collection. I have used this little fella often for Get Well Cards. Meljens Design Challenge: Karaoke-use song as your inspiration. I chose The Fever by Bruce Springsteen. Hello! I have another CAS Card that is very simply made with 2 stamps from GKD Always Autumn set by Theresa Momber stamped on GKD Ivory CS. 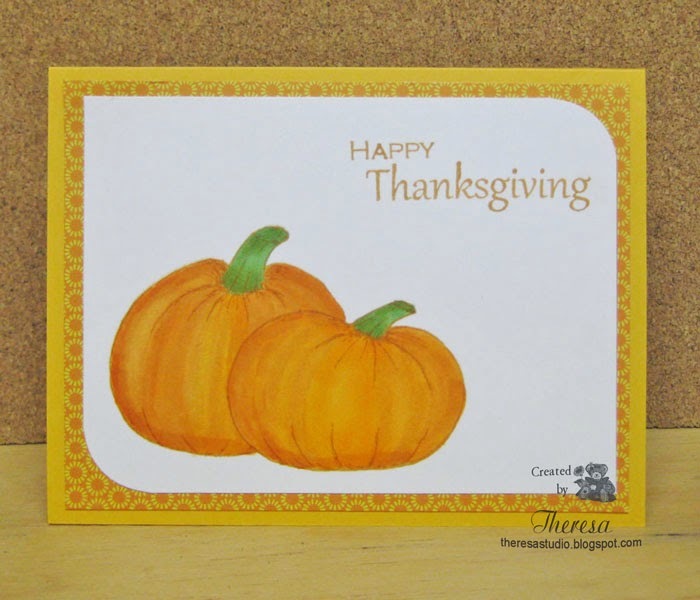 I used Memento Rich Cocoa ink for the sentiment and Tangelo Ink for the leaf which I colored with Pencils and OMS. I also added glossy accents to the leaf. I embossed a section of the Ivory CS with Cuttlebug Divine Swirls and added a Leafy Ribbon, GKD Gold Cord, and some Dew Drops to finish. I used a Pumpkin Spice Card base. I made this for Cat's Stamp TV Mix it Up Monday Challenge to keep it simple and make a CAS card. Hello! 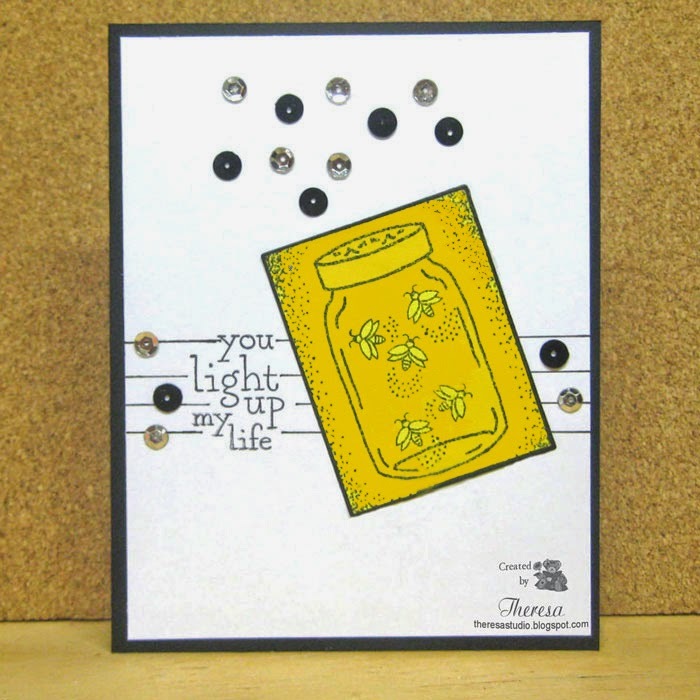 I was just playing with some items on my work counter and found this stamped image of the Jar of Lightning Bugs (Repeat Impressions stamp) and some old sequins and thought "How can I use these?" 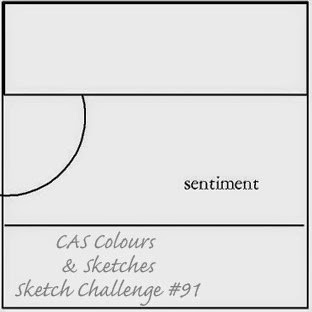 I combined 3 challenges and came up with a CAS card using a sketch challenge, a color challenge, and a challenge to use sequins with a celebration theme. My take on a celebration was to celebrate the person who lights up my life...my DH. The sentiment is from a Flourishes stamp set and stamped in Memento Tuxedo Black ink. I simply drew in lines to anchor the Jar and Words together. I had fun making a card for Runway Inspired Challenge which uses fashion to inspire us to create a card. 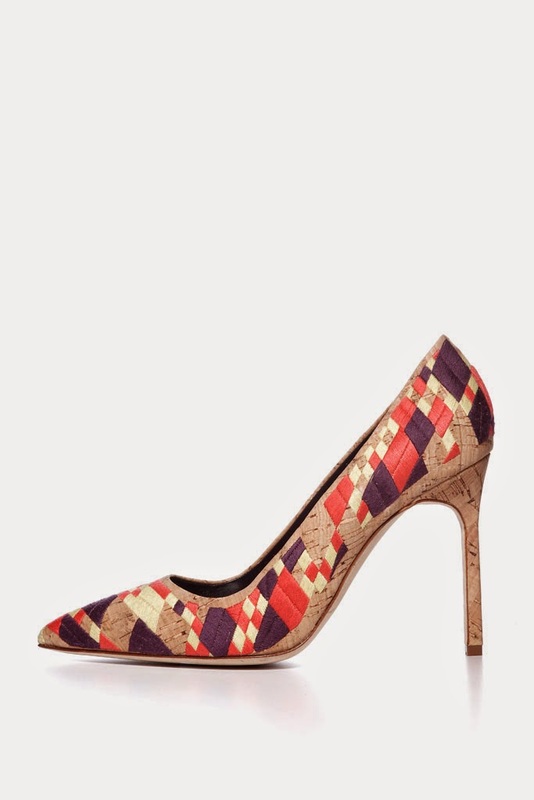 This week's photo is a Shoe from Manolo Blahnik to use as inspiration. 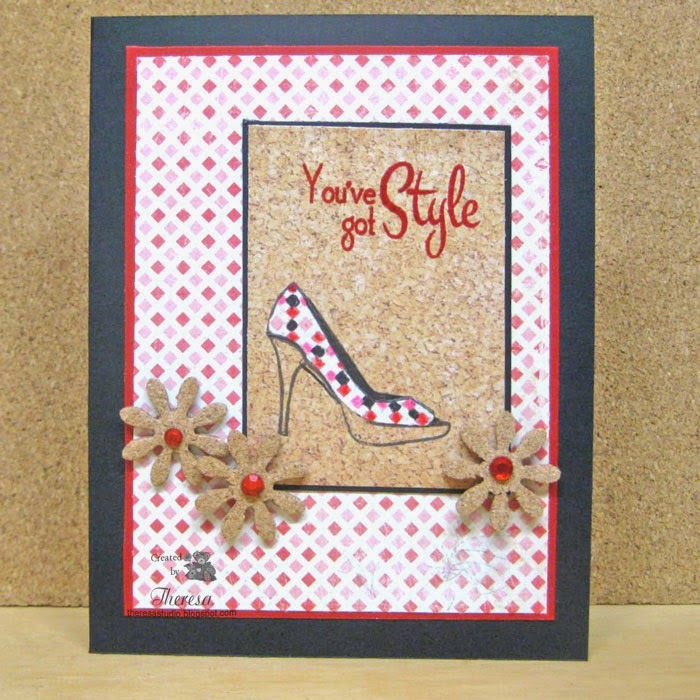 I did the obvious for my card....I literally made a shoe with paper piecing and cork elements and pulled colors from the photo. I stamped the shoe on a Cork Pattern Paper from Fancy Pants Wonderful Day pad with Memento Tuxedo Black ink and paper pieced with a pattern paper from Crate Paper DIY collection. I heat embossed the sentiment with Versamark ink and Red EP. I assembled the card following the Tuesday Morning sketch shown below using a Black card base, a layer of Red CS, a layer of the pattern, and then the image matted with Black CS. My embellies are Flowers of Cork cut with Heartfelt Creations Daisy Patch dies topped with Red Rhinestones. Stamps are from MFP You've Got Style set. In my younger years this is definitely a shoe I would love to have worn. I wonder if it is available in 51/2 narrow? Hello! I have another CAS Card that is very simply made with 2 Stamps from GKD Always Autumn set by Theresa Momber on GKD Ivory CS. I used Memento Peanut Brittle ink and colored pumpkins with Copics. I simply layered this on an Unknown Pattern Paper and Honey Colored card base. No embellishments, bling, etc. That's all folks! Today, I am back to thinking of fall and have used inspiration from The Cutting Edge Challenge to create this project. 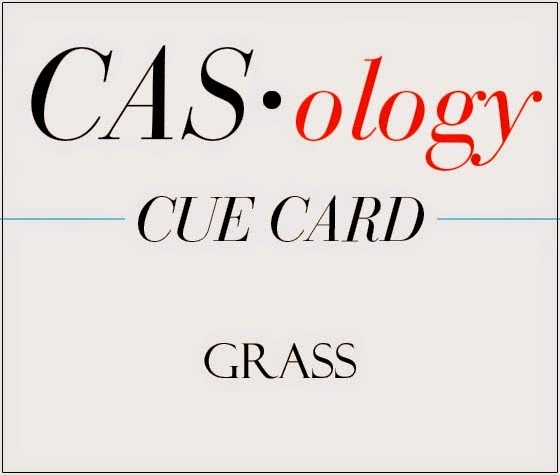 Pulling colors of orange, blue, green, brown and black, lower edge of grass, and the layout of their photo, I designed the card with those elements. I cut the pumpkin and grass on the Cameo using Silhouette files and cut birds and fence with dies from Marianne. I assembled all the pieces on a card base of Blue CS and stamped the sentiment from SU with Memento Tuxedo Black ink. All cardstock was from stash and scraps. The Cutting Edge Challenge: # 10 See graphic on right. 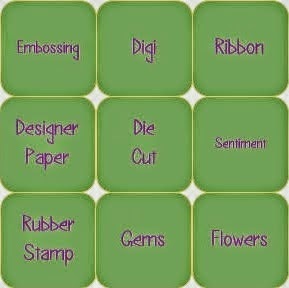 Die Cut Diva Challenge: September challenge is to use something new. I used new Silhouette cut files. Making a card with this many die cuts and no coloring is new to me. I am playing with Christmas cards again. I pulled out some Heartfelt Creations leftover papers from last year's Christmas Collection and created this card featuring a verse from HC Sweet Memories Set. I stamped the sentiment with SU Brocade Blue ink on some of the Pattern Paper and cut with Nesties Circle Die and matted with a circle of Blue CS same as the Blue Card Base. Before adding the verse, I stamped the HC Pinecones in the lower right corner of the Pattern Paper layer with DI Brushed Corduroy ink and colored with brown and green pencils. I also highlighted some of the background pattern paper with the pencils. The Blue card base was layered with a mat of Leather CS and then with the rest of card. 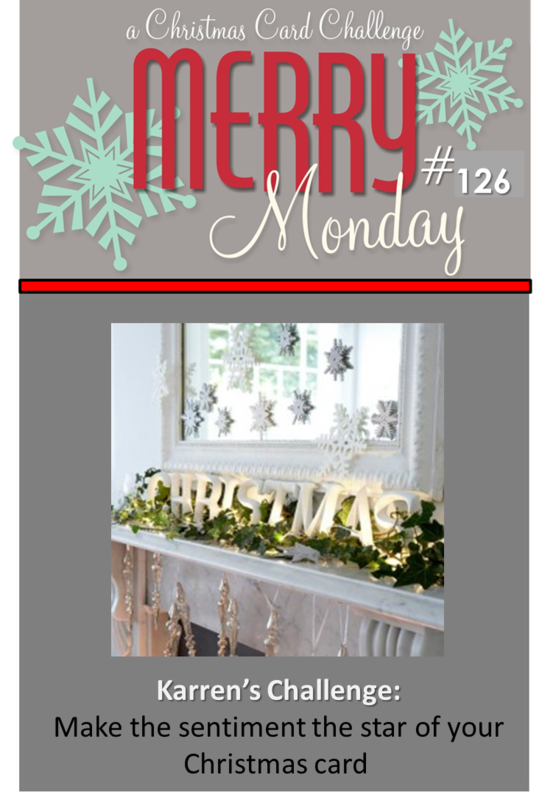 Merry Monday Christmas Challenge: # 126 The Words Have it...Make the sentiment the star of your card. Cratyhazelnut's Christmas Challenge Extra: For Sept, anything goes for Christmas. 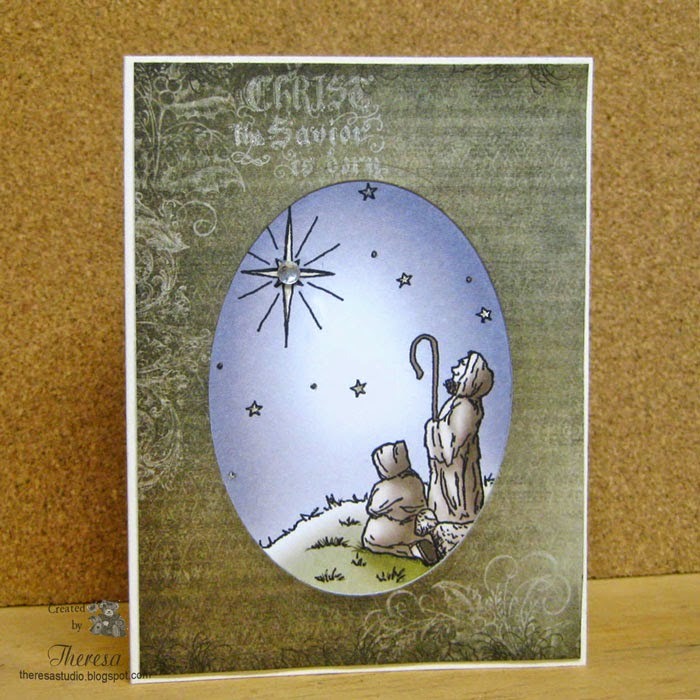 This Christmas card is for Hazel's Challenge to use our interpretation of 'silent night' for a Christmas card. I used images and papers from Heartfelt Creations Christmas Collection from last year. I think the shepherds viewing the Star capture the feel of a Silent Night. I cut an oval with Nesties Die from the background paper and placed over the image and attached to a Card Base of Ivory CS. I highlighted the words on the Pattern Paper with Clear Star pen instead of stamping a verse. I placed a rhinestone on the star and used Clear Star pen to give shine to the stars. Hello! Thanks for stopping by today. 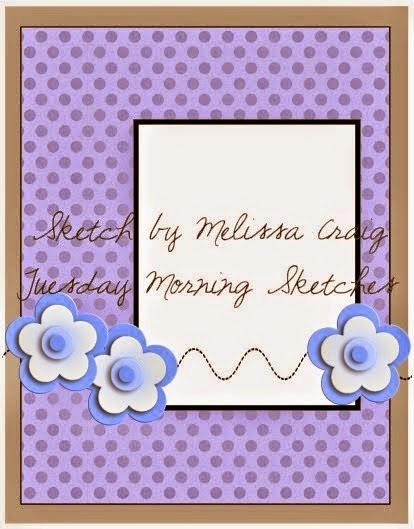 Today I am sharing a very quick and simple one layer card. 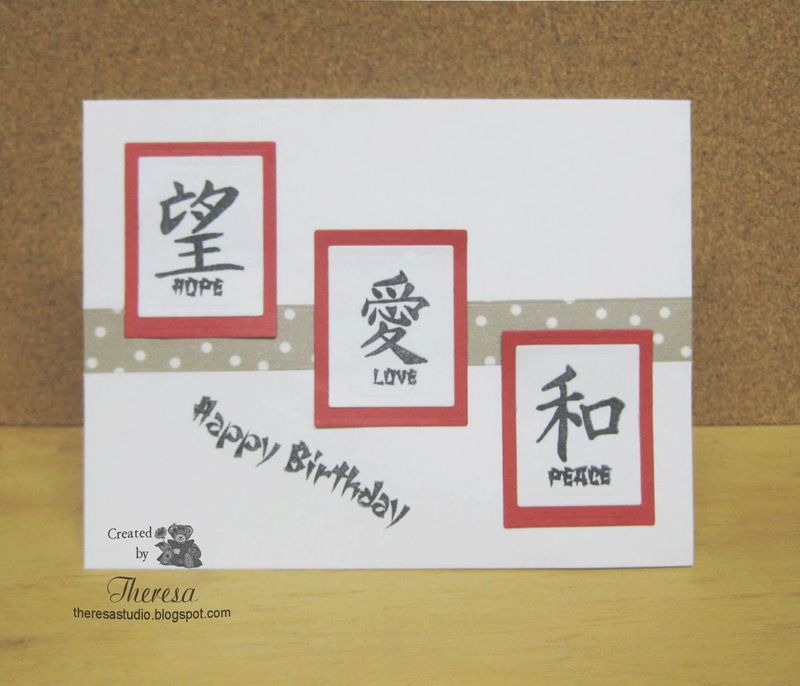 I stamped 3 Chinese characters with words on White CS with Memento Tuxedo Black ink and trimmed with Rectangle Nesties and layered on Red CS cut with more Nesties. My husband suggested I add some Washi tape for another Oriental element....he said "it is Japanese, isn't it?" 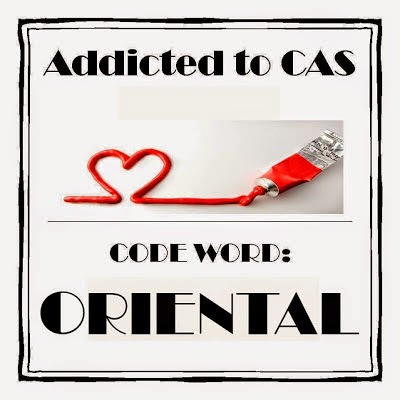 I finished with the sentiment which has an Oriental flair. Stamps are from MFP's Asian Delight set. Hello! I have been playing with water coloring with Distress Inks. Using Avery Elle's Petals & Stems stamp set, I stamped the large flower on watercolor paper with Picked Raspberry ink and added some Squeezed Lemonade and Spun Sugar inks using a water brush to color. The stems were stamped with Crushed Olive ink as well as the sentiment and brushed in with a water brush. I added some pink sequins keeping the card CAS. I added some Wink of Stella glitter but could not get to show on photo. (I just got the glitter brush and could not wait to try.) 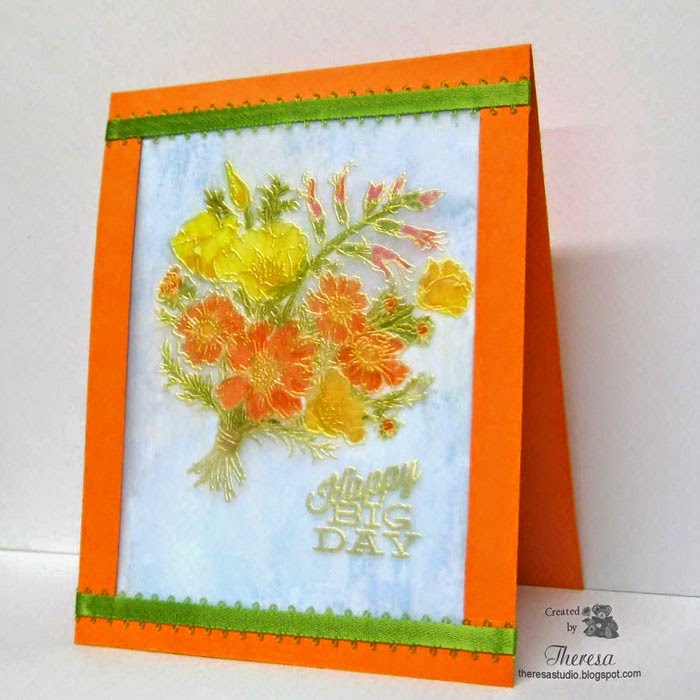 I added the image to a card base of GKD Asparagus Green CS with a layer of Pink Pattern Paper from MME Indie Chic Saffron pad. 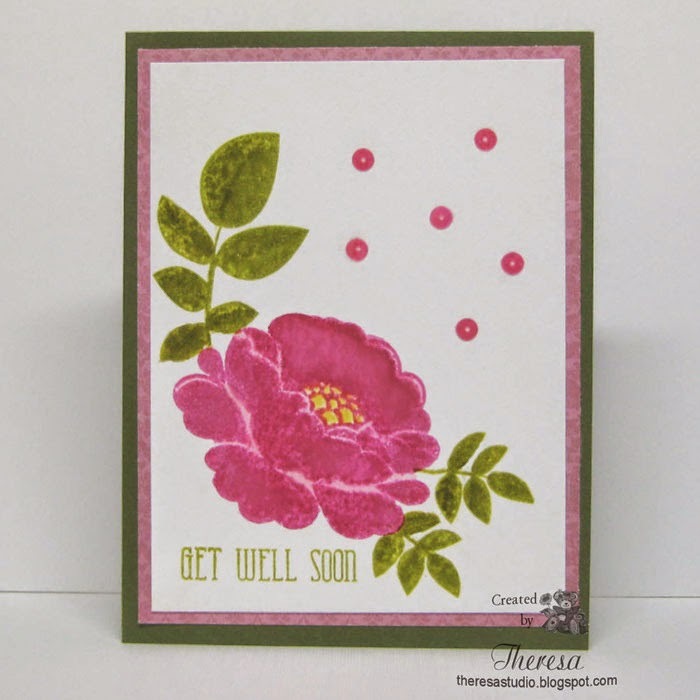 I just love to make cards in this combo of pink and green. Hello! I have a hard time making a black and white card but I like the results of this one that I made for the challenge at The House That Stamps Built to create with Black, White and Gray. All stamps used are from Repeat Impressions. 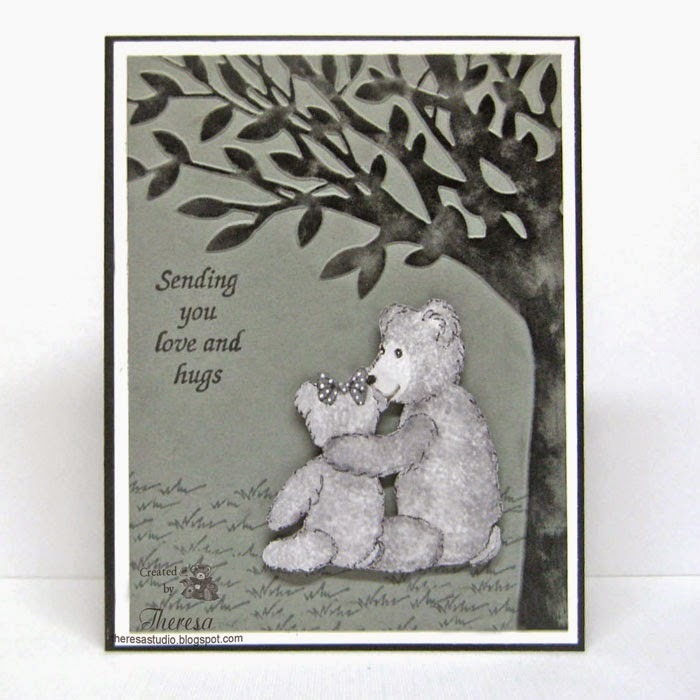 I wanted to use the Embossing Folder Leafy Tree by Darice with the Bear Hug couple sitting underneath but the bear stamp faces the wrong way. I decided to change their direction by doing reverse stamping or sometimes called mirror stamping. This I had never done before so it took some trial and error before I had the image in reverse that I was happy with. I colored the bears with Copics N 0, 2, 4 and then created a furry texture using a piece of terry cloth and Copic colorless blender. I added some polka dots to the hair bow with White Gelly Roll. I fussy cut the bears and set aside. I used a Black CS Card base and added a mat of White CS. For the next layer I embossed a Gray CS with the Leafy Tree EF and inked the raised area with Memento Tuxedo Black and added some grass with a Repeat Impression stamp and Memento Gray Flannel ink. 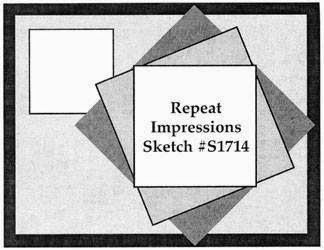 I stamped the Repeat Impression Sentiment with Tuxedo Black. I assembled the layers and added the Bear Couple with foam tape for more dimension. I really like this card and trying some new techniques. 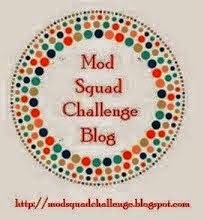 The Crafting Café Challenge: Shades of one. I think this card qualifies unless white is not allowed. Welcome! I hope you have time for a glass of wine. I am using Repeat Impressions stamps from their Wine Series set. I stamped the bottle, glasses, and sentiment with Memento Tuxedo Black ink on a one layer card of White CS. I colored the images with assorted pencils and markers and added some shadows with a gray pencil. I tried to make the label on the bottle look very vintage..... the older the wine, the better it is. I scored 3 lines at the lower edge to finish and anchor the card. Less Is More Challenge: This week it is a One Layer Challenge and the theme is Beverages. Hello! 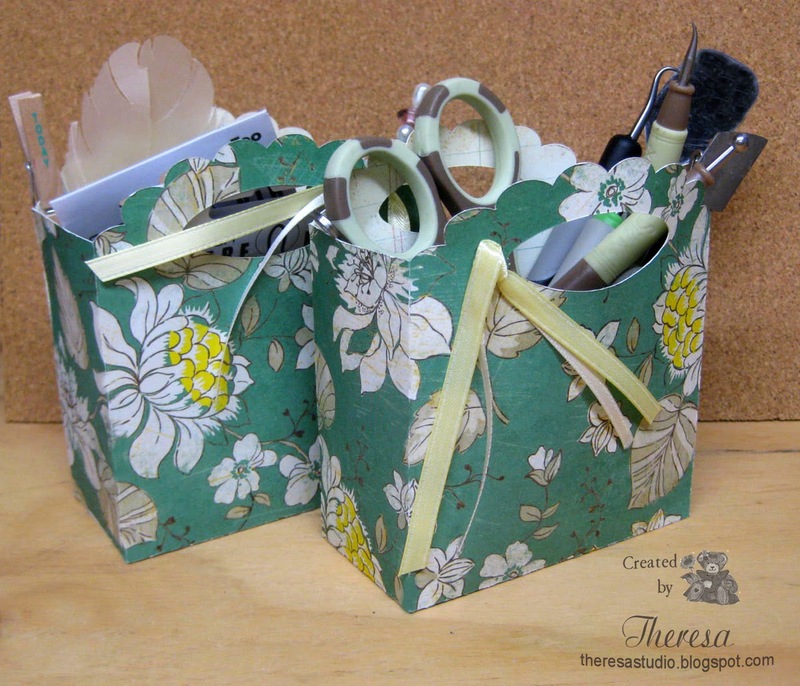 Today I am sharing a Ruffle card made with leftover pattern papers and punches. 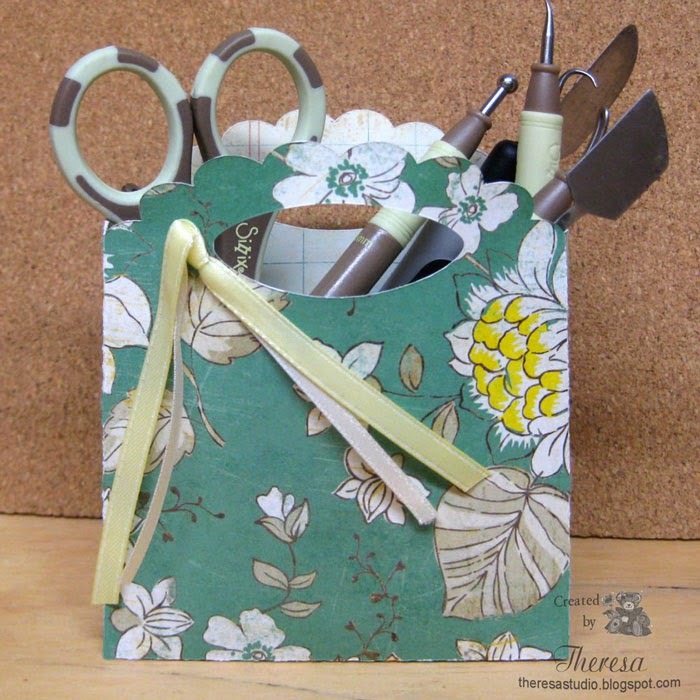 This is a great card to use up all those strips of paper that are not very big. Papers: Scraps of MME Pattern Papers, Assorted solid colors scraps, and White Cardstock. Hello! It is certainly feeling and looking like Fall. 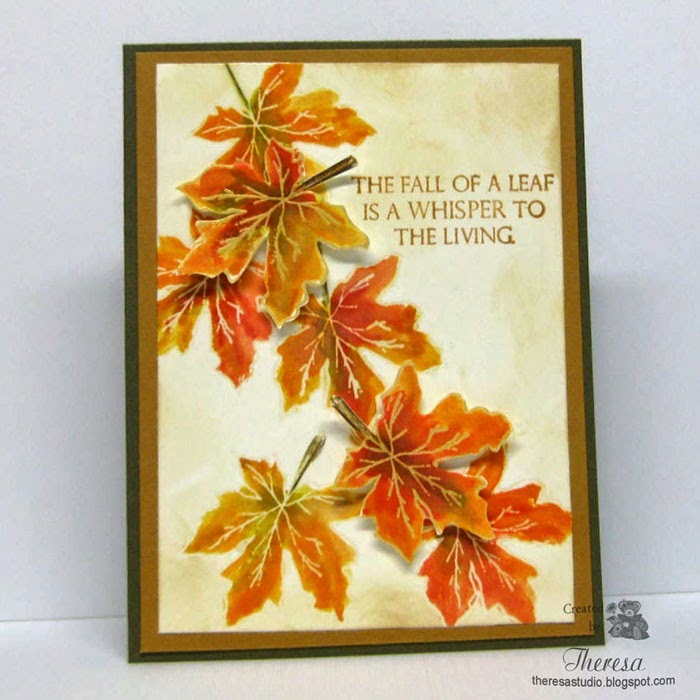 Today I am sharing a fall card using an old PSX leaf stamp from 2000 that was one of the first leaf stamps that I bought. I created the background layer using the emboss resist technique with Memento inks, Versamark, clear embossing powder and the leaf stamp. Starting with a card base of orangey red, I layered a mat of Copper Metallic CS, and then the layer of leaves. I finished with a Verse from GKD "A Year of Leaves" stamped with Versamark and embossed with Copper EP. I matted this with a die cut of the Copper Metallic CS. Spellbinders Dies used for the verse and mat. Welcome! I hope everyone had a great weekend! I love Monarch butterflies and it is a thrill to see them in the garden. 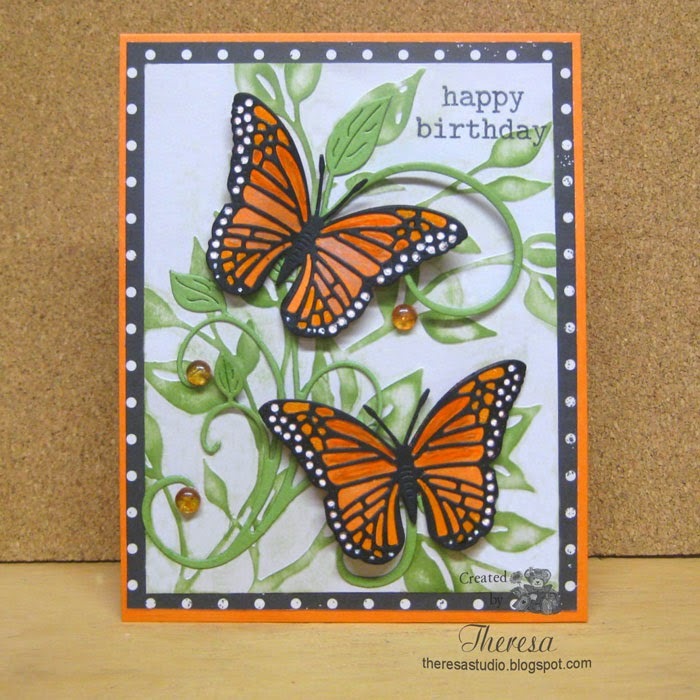 I attempted to make these Butterflies look like Monarchs by using Cheery Lynn dies and cutting butterflies out of Black CS and the matching angel wings of Orange CS. I colored spots with White Gel , Orange Gelly Roll, Yellow Glaze, Orange Glaze, and Clearstar Pens . The yellow markings do not show that well.....all looks orange. But I think they look good enough to be Monarchs. I made my background by embossing a very light gray CS with Cuttlebug EF Leafy Branch and inked the raised areas with Memento Bamboo Leaves ink. I then cut a Cheery Lynn Fanciful Flourish out of Green CS and attached that loosely to the background that I created. I attached the flying "Monarchs" with glue dots and added some Orange Dew Drops. I attached this to a dotted pattern paper from Echo Parks Apothecary Emporium pad and a card base of Orange CS. The birthday sentiment from Winnie & Walter was stamped with Memento Tuxedo Black ink. I really like the results of this card. Simon Wednesday Challenge: Simon says make your own background. I used an embossing fold and ink to create my background. Seize the Birthday: My card will fit the Anything Goes challenge since I did not do the Sweet Treats Option. But I consider it a "Sweet Treat" to see Monarchs in the garden. Hello! Are you having a good time today? My card is all about letting the good times roll. I have another circus theme card. 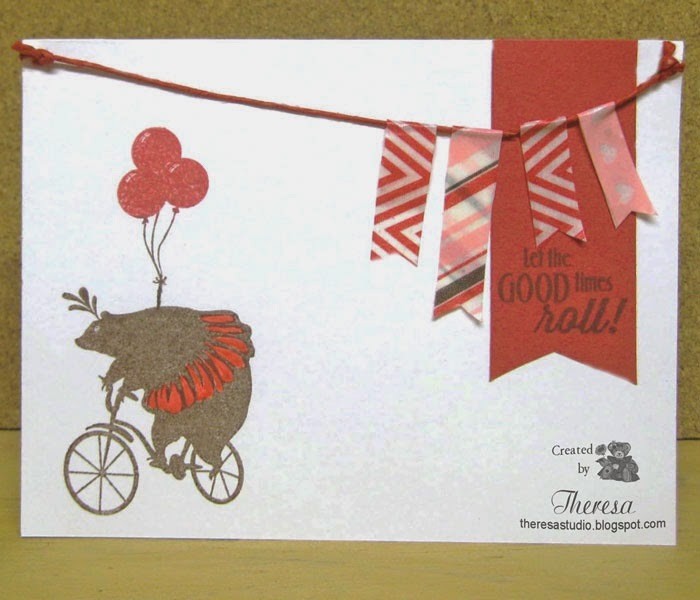 I am using a circus bear riding a bicycle for the focus on the card that I made following CAS(E) this Sketch challenge. All the stamps are from Flourishes Under the Big Top stamp set.. Inks used were Memento Rich Cocoa and Lady Bug. I used Red Twine and MME Washi Tapes to create the banner on one layer of White CS and added a banner of Red CS with sentiment. Come One! Come All to the Circus! Hello! I am now on a Circus theme roll. 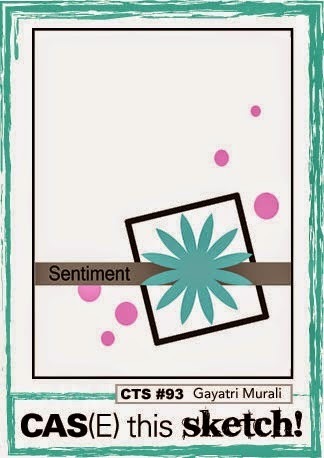 I am using Flourishes Under The Big Top stamp set for all the images and sentiment. This is the first time that I have used this stamp set. I triple stamped the Ticket stamp across the bottom of the Red Card Base. 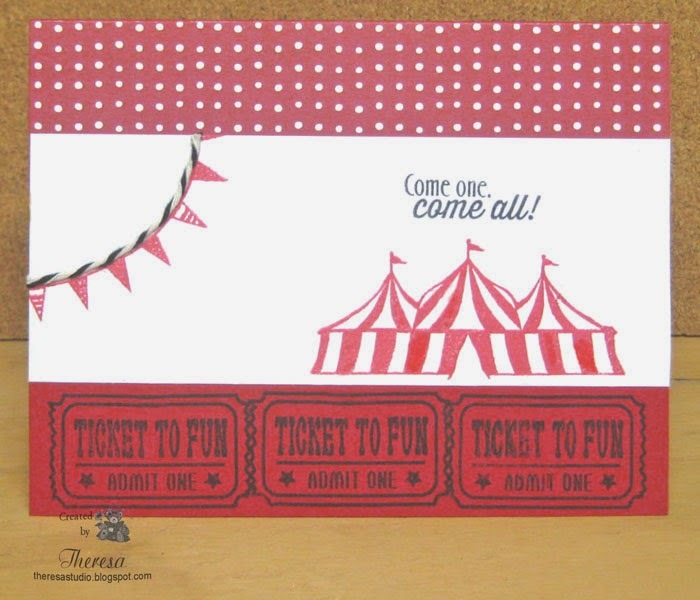 Above that is a White CS strip stamped with the Circus Tent, banner, and sentiment. I added some white and black twine from stash along the rope of the banner. The top strip is a Dotted Pattern Paper from a Pebbles pad. Inks used were Memento Tuxedo Black and Love Letter. 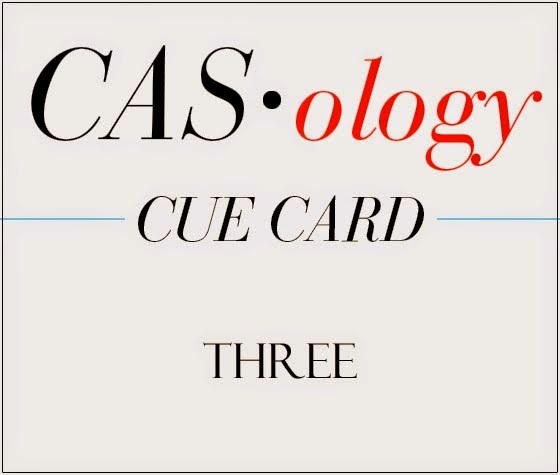 CASology: Week #113 Cue Card is Three. I used the ticket stamp 3 times and the tent is for a 3 ring circus. Papertake Weekly Challenge: Repeat, Repeat! I have repeated the use of the ticket. 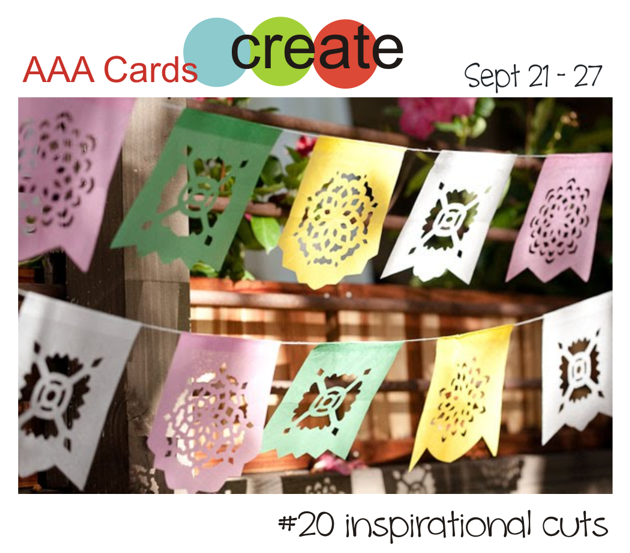 Crafty Sentiments Challenge: Spots and/or Stripes. 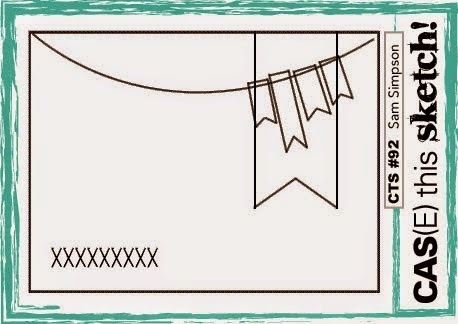 I have stripes on the tent and pennants and spots on the top of the card. NBUS Challenge #2: Darnell has another challenge to use "never before used schtuff". My NBUS is the stamp set Under the Big Top. 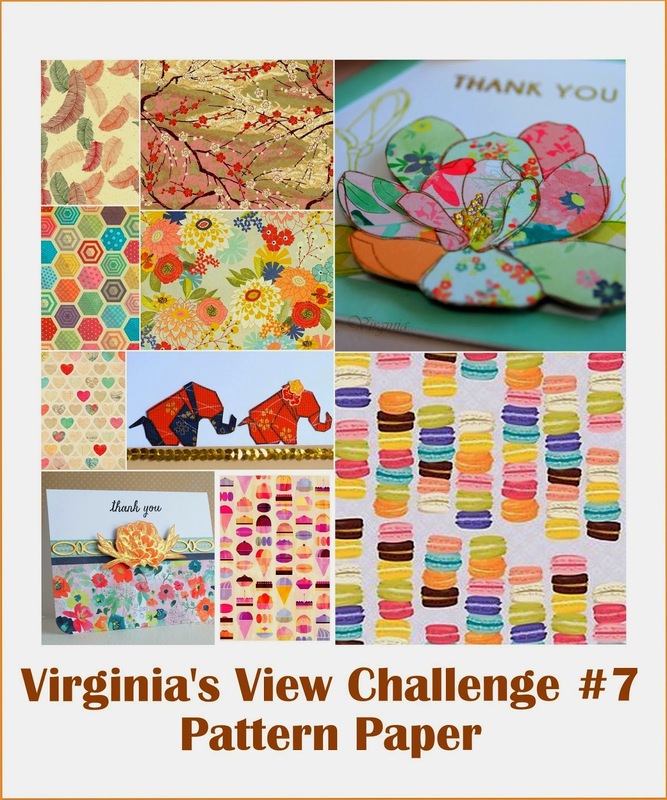 Today I am sharing a project to enter for this month's Challenge at Scor-pal's More Than One Score Challenge # 8. We are to use "Fun Storage Ideas" theme on a scored project. We can make a caddy, a set of drawers, a photo album, anything that stores something, not a gift bag/box that is only temporary. And it must have more than one fold. I then scored the fold lines with Scor-pal and assembled the box using Scor-tape. 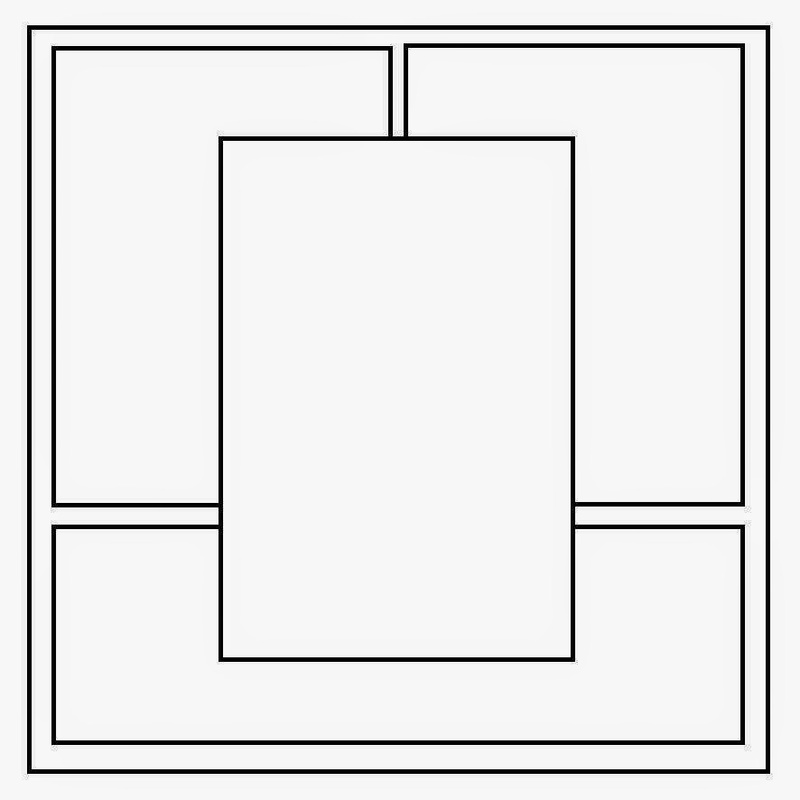 ( When I cut with the Cameo, I eliminated some of the dash lines for folds which I think weaken the folds.) The handles on the "caddy" make it easy to pick up and move around. I added some ribbon streamers just for the fun of it. Actually I made 2 of the "caddies"....the second one is used for leftovers until I use them or find a place for.